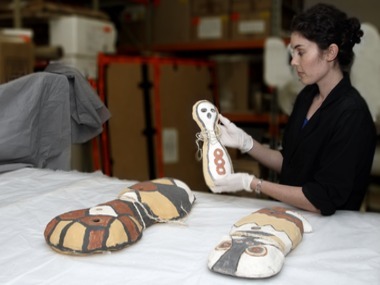 Museum and Art Gallery of the Northern Territory (MAGNT) Conservator Charlotte Walker pictured with three of the ‘Bagu Firemakers’. A three-dimensional entry featuring 14 spirit figurines made from clay, timber and string are one of the 96 artworks that have arrived at the Museum and Art Gallery of the Northern Territory (MAGNT) for this year’s 27th Telstra National Aboriginal & Torres Strait Islander Art Award. Telstra Art Award curator Kate Podger said the group work titled, Bagu with Jiman was received from 11 artists based at Girringun Arts, North Queensland that specialise in weaving, painting and pottery. “Girringun Arts represents artists belonging to nine tribal groups including the Nywaigi, Warrgamay, Gugu Badhun, Warungnu, Girramay, Gulnay, Bandjin, Djiru and Jirrbal tribal groups, with traditional country in the North Queensland region,” Ms Podger said. “The work is based on traditional fire making tools of the Girringun Rainforest people, with each ‘man’ composed of a ceramic body (bagu) and containing holes for the firesticks (jiman). Traditionally, bagu were made using bubadilla (milky Pine wood) and were painted with ochres, fire ash and wallaby blood. These traditional objects are now providing solid grounding for artists who are learning to work with new materials such as clay. Girringun artists have used clay and ochre coloured glazes to make the bagu spirit figures in ‘Bagu with Jiman’, as traditional materials are becoming harder to source and have specific uses and protocols for their manufacture and use. Girringun Arts Centre Coordinator, Nina Dawson said this is the first time Girringun Arts has entered the Telstra Art Awards and that the artists were very excited to find out they had been selected in this year’s Award. “It’s a great opportunity for us, very exciting,” said Nancy Beeron, one of the Elder Bagu artists. ”Its great to see many years of storytelling now coming real in our Art, a great achievement to all,” said Daniel Beeron one of the younger Bagu artists of the group. The Telstra Art Award comprises the $40,000 Telstra Award and $4,000 to other categories including; the Telstra General Painting Award, the Telstra Bark Painting Award, the Telstra Work on Paper Award and the Wandjuk Marika Memorial 3D Award (also sponsored by Telstra) in addition to the Telstra New Media Award ($3,000). The 27th Telstra National Aboriginal & Torres Strait Islander Art Award is supported by the Visual Arts and Craft Strategy, an initiative of the Australian, State and Territory Governments.